**Disclosure: Booklook Bloggers has provided us with a complimentary copy of this book to help facilitate this review/feature. I feel so blessed that my two younger children (11 and 13) love to read! Especially my daughter, who you will always find in her room, relaxing and indulging in a good book! Talk about a proud "Mom Moment"! 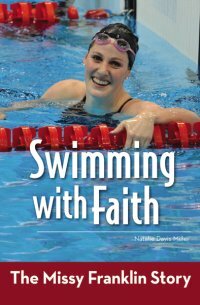 Her latest venture was Swimming with Faith: The Missy Franklin Story. Missy Franklin is one of the most talented swimmers in the world. She is a four-time Olympic gold medalist and currently holds the world record in the 200-meter backstroke and American records in both the 100-meter and 200-meter backstroke. She was Swimming World’s World Swimmer of the Year and the American Swimmer of the Year in 2012. This story tells of her rise in fame and humbleness in the sport. My daughter plays softball and she really enjoyed reading this book. Although it was not her sport, it really is good for anyone involved in a competitive sport. My daughter is 11 years old and read this book straight through. What my daughter got out of this book - "This book tells me to not give up on my dreams and it is never to young to start something." Affordable, Encouraging book for any young reader! KID APPROVED!